BOSTON -- Former NFL star Aaron Hernandez wrote a reference to a biblical passage in ink on his forehead and in blood on the wall of his prison cell before he hanged himself with a bed sheet, state police said in an investigative report released Thursday. The former New England Patriots tight end was found naked April 19 at the Souza-Baranowski prison, where he was serving a life sentence in the 2013 murder of a man who had been dating his fiancee's sister. His suicide came five days after he was acquitted in the 2012 gun slayings of two men in a car. A report released by state police on Thursday says "John 3:16" was written on Hernandez's forehead and on the cell wall. Included in their final report are photos of the bible investigators found in Hernandez's cell, CBS Boston reports. The Bible passage says: "For God so loved the world, that he gave his only begotten Son, that whosoever believeth in him should not perish, but have everlasting life." The report, from a state police detective assigned to Worcester County District Attorney Joseph Early Jr.'s office, said a correction officer found Hernandez around 3 a.m. Correction officers found that cardboard had been shoved into the tracks of Hernandez's cell door to prevent the door from opening. Hernandez also had put shampoo on the floor to make it slippery, the report states. Once the correction officers got inside the cell, they found Hernandez hanging from a bed sheet tied around the window bars. The officers and medical staff performed CPR, but Hernandez never regained consciousness. He later was pronounced dead at a hospital. State police said Hernandez's right middle finger had a fresh cut and there was blood on adjacent fingers. Besides the "John 3:16" written on his forehead, there also appeared to be a large circular blood mark on each of his feet. On the wall of the cell were several drawings and "John 3:16" written in what appeared to be blood. Under the drawings was a Bible open to John 3:16, with the verse marked in blood. Three handwritten notes were found next to the bible. A description of the notes was redacted from the state police report. 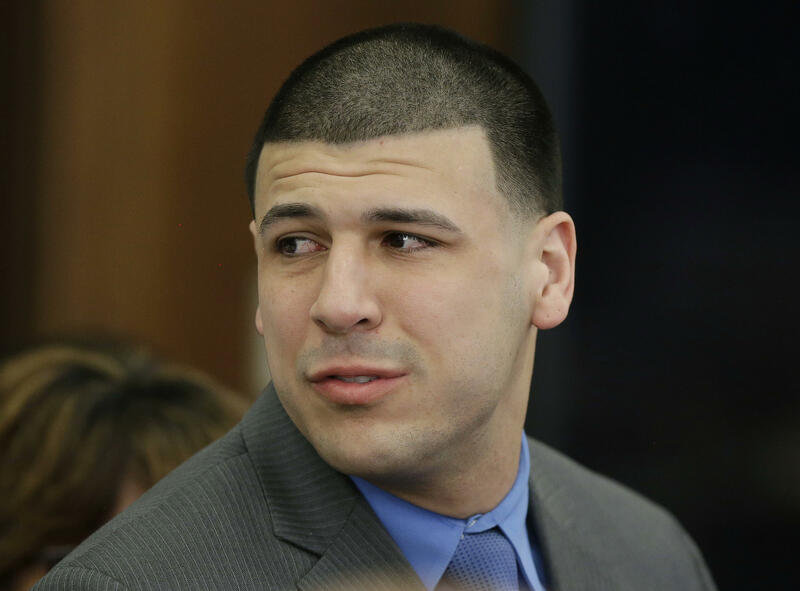 Lawrence Army Jr., the lawyer for Hernandez's jailhouse friend Kyle Kennedy, said last month that one of three suicide notes the former NFL star left in his cell was intended for Kennedy, a 22-year-old Uxbridge resident who is serving a prison sentence at Souza-Baranowski following his 2015 arrest for armed robbery, assault with a dangerous weapon, escaping a municipal lockup, speeding and other charges. Quoting from a letter Hernandez wrote to Kennedy's father, Army read, "Mr. Kennedy, it's Aaron. I'm writing to you and Pure doesn't know. He's my brother and he always will be." About two hours later, the officer saw a sheet hanging in front of the door to Hernandez's cell. The officer said he asked Hernandez to remove the sheet or sound off. As the officer poked at the sheet it fell, and he saw Hernandez hanging from the window, according to the report. "Hernandez does not make any apparent indication of an intent to harm himself during any of the phone calls," the report states. But one inmate told investigators Hernandez told him the night before he died, "When you die your soul gets reincarnated," the station reported. Another inmate told investigators Hernandez mentioned that if you die in prison and have an open appeal your case gets thrown out..
An autopsy performed by the state medical examiner's office determined the cause of Hernandez's death was asphyxia by hanging and the manner of death was suicide. The state police report said toxicology tests showed Hernandez's blood came back negative for all substances tested, including synthetic marijuana. Hernandez's lead attorney in his recent double murder trial, Jose Baez, has pledged to do an independent investigation into his death. The defense team sharply criticized state investigators, saying some leaked information to reporters while failing to keep the Hernandez family informed. "The unprofessional behavior of those entrusted to impartially and professionally conduct an investigation into Aaron's death has caused grave concern as to the validity and thoroughness of the investigation," Hernandez's attorneys said in a statement.